Spring is arriving late in the west and early in the east by as much as a day each year for the past decade; spring begins with a natural event: leaf out of trees and plants. That is not good news for migrating birds who follow a strict schedule for their stressful journeys. 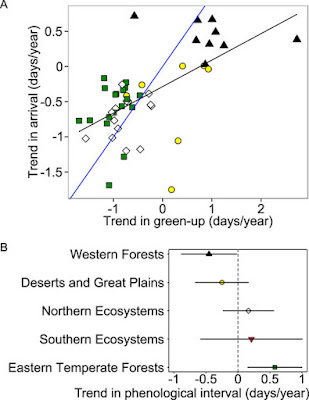 A new study in Scientific Reports says that 9 of 48 species studied were unable to adjust their internal clocks to coincide with local photosynthesis ("green-up"). Climate change is predicted to drive hundreds of bird species to extinction and curtail the range of others. Fortunately, the majority of species seem to be able to cope with the new climate imposed by man. The blue line indicates when arrival and green-up are synchronous. Black is a linear regression of the data points. The variance in the line slopes is statistically significant. Each symbol represents a different ecosystem and species. The chart shows that earlier arrivals are not keeping up with altered photo-periods. In the words of the study, "arriving too early at breeding grounds can bring risk of freezing (due to cold temperatures) and hatching chicks before peak resource abundance, whereas arriving too late can mean fewer nest sites, fewer mates with successfully guarded territories, and declining resource abundance. 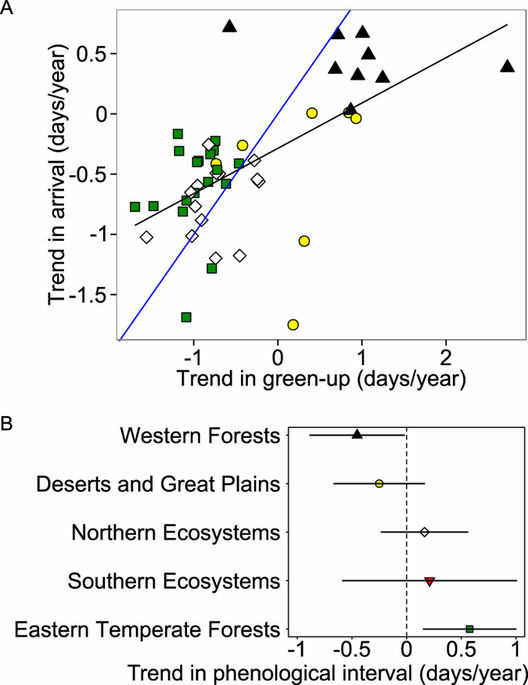 As such, the loss of synchron[icity] between insect emergence and migrant bird arrival phenology [timing] can be accompanied by negative fitness consequences" which result in declining populations. The species that are most negatively impacted by climate change are Yellow Cuckoos, Rose-breasted Grosbeaks, Scarlet Tanagers, and Indigo Buntings. The scientists used data collected by "citizen scientists"--birdwatchers--posted to the website, eBird.